Your kitty might have to keep its paws to itself but this Fishbowl Cat Clock will allow the cat to swipe at the fishes perpetually for eternity. Clock face features fishes and bubbles, along with hour, minute and second hands. Hang this lovely clock up on the wall or prop it against the shelves. 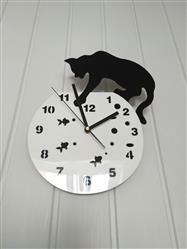 Decorative clock's black and white silhouette design is perfect for cat lovers and complements any décor.